G. Robles, J.M. Fresno, M. Sánchez-Fernández, J.M. Martínez-Tarifa, Antenna Deployment for the Localization of Partial Discharges in Open-Air Substations. Sensors, 2016, vol. 16, no 4, p. 541. Abstract – Partial discharges are ionization processes inside or on the surface of dielectrics that can unveil insulation problems in electrical equipment. The charge accumulated is released under certain environmental and voltage conditions attacking the insulation both physically and chemically. The~final consequence of a continuous occurrence of these events is the breakdown of the dielectric. The electron avalanche provokes a derivative of the electric field with respect to time, creating an~electromagnetic impulse that can be detected with antennas. The localization of the source helps in the identification of the piece of equipment that has to be decommissioned. This can be done by deploying antennas and calculating the time difference of arrival (TDOA) of the electromagnetic~pulses. However, small errors in this parameter can lead to great displacements of the calculated position of the source. Usually, four antennas are used to find the source but the array geometry has to be correctly deployed to have minimal errors in the localization. 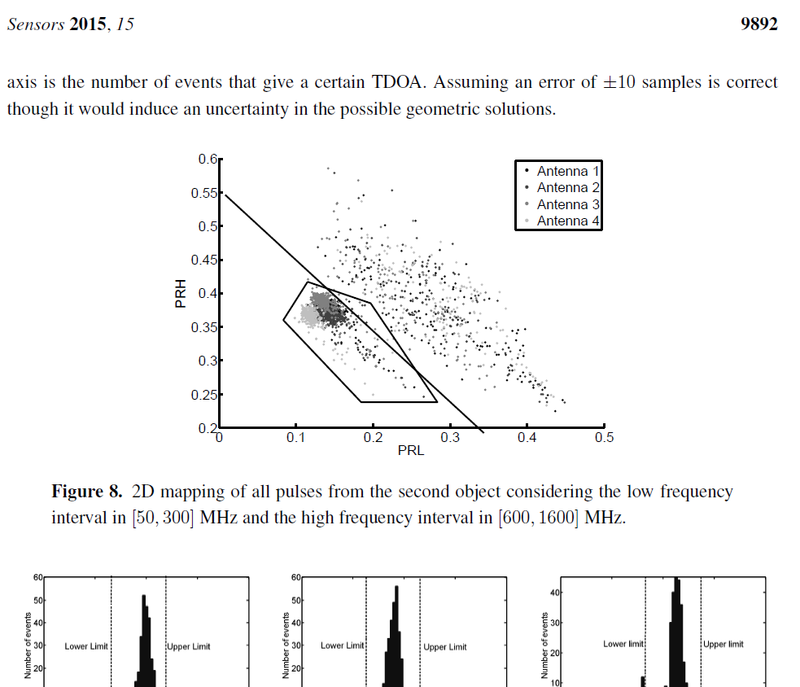 This paper demonstrates, by an~analysis based on simulation and also experimentally, that the most common layouts are not always the best options and proposes a simple antenna layout to reduce the systematic error in the TDOA calculation due to the positions of the antennas in the array. Keywords – antennas; radio-frequency localization; partial discharges; particle swarm optimization. G. Robles, J.M. Fresno, J.M. Martínez-Tarifa Separation of radio-frequency sources and localization of partial discharges in noisy environments. Sensors 2015, 15(5), 9882-9898 (ISSN 1424-8220). Abstract – The detection of partial discharges (PD) can help in early-warning detection systems to protect critical assets in power systems. The radio-frequency emission of these events can be measured with antennas even when the equipment is in service which reduces dramatically the maintenance costs and favours the implementation of condition-based monitoring systems. The drawback of these type of measurements is the difficulty of having a reference signal to study the events in a classical phase-resolved partial discharge pattern (PRPD). Therefore, in open-air substations and overhead lines where interferences from radio and TV broadcasting and mobile communications are important sources of noise and other pulsed interferences from rectifiers or inverters can be present, it is difficult to identify whether there is partial discharges activity or not. This paper proposes a robust method to separate the events captured with the antennas, identify which of them are partial discharges and localize the piece of equipment that is having problems. 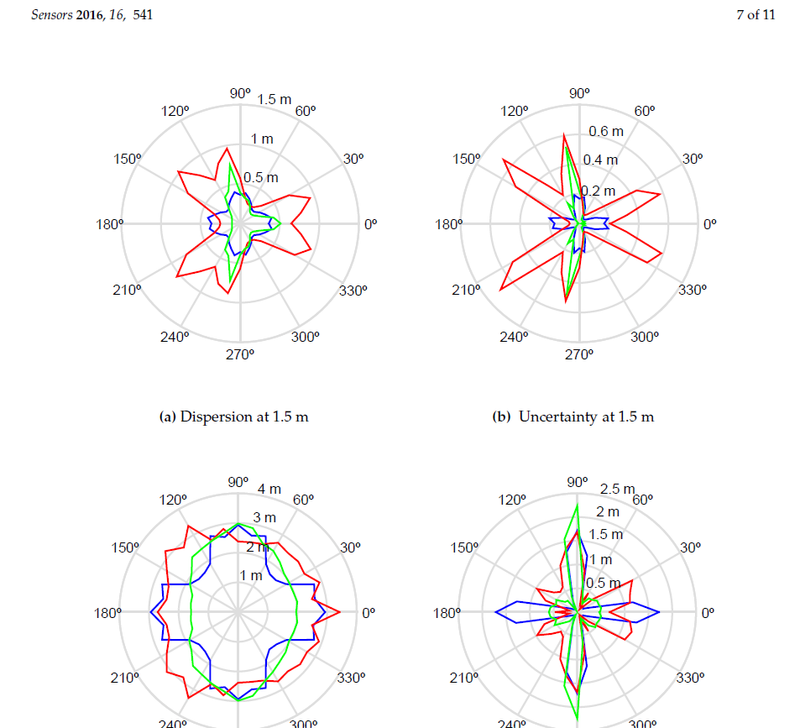 The separation is done with power ratio (PR) maps based on the spectral characteristics of the signal and the identification of the type of event is done localizing the source with an array of four antennas. Several classical methods to calculate the time differences of arrival (TDOA) of the emission to the antennas have been tested, and the localization is done using particle swarm optimization (PSO) to minimize a distance function. Keywords – Partial Discharges; Spectral Power; Condition Monitoring; RF Measurements; RF Localization; Particle Swarm Optimization. B. García, D. García, G. Robles Development of a moisture-in-solid-insulation sensor for power transformers. Sensors 2015, 15(2), 3610-3624 (ISSN 1424-8220). Abstract – Moisture is an important variable that must be kept under control to guarantee a safe operation of power transformers. Because of the hydrophilic character of cellulose, water mainly remains in the solid insulation while just a few parts per million are dissolved in oil. The distribution of moisture between paper and oil is not static but varies depending on the insulation temperature and thus, water migration processes take place continuously during transformers operation. In this work, a sensor is presented that allows the determination of the moisture content of the transformer solid insulation in steady state and during moisture migration processes. 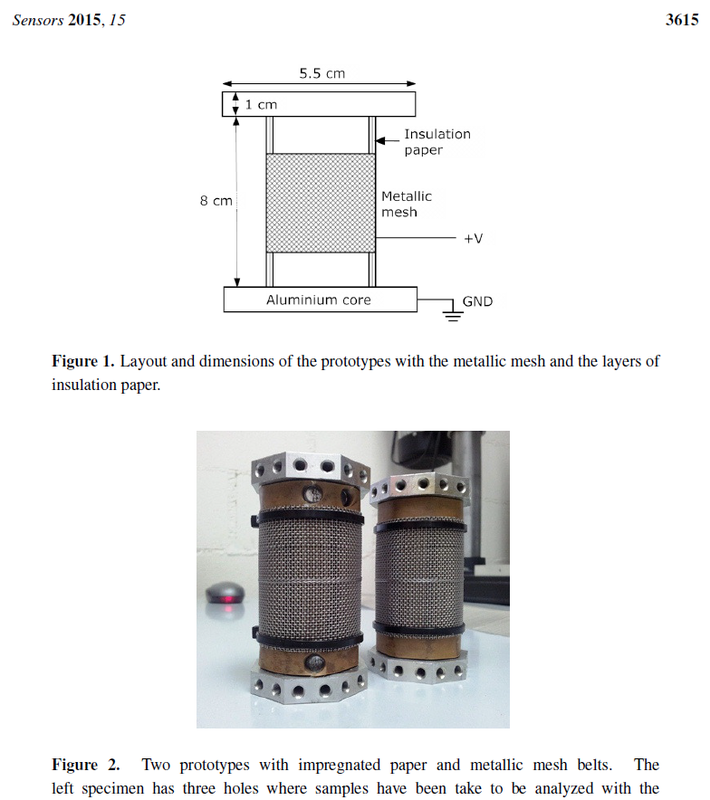 The main objective of the design is that the electrodes of the sensor should not obstruct the movement of water from the solid insulation to the oil, so the proposed prototype uses a metallic-mesh electrode to do the measurements. The measurement setup is based on the characterization of the insulation dielectric response by means of the Frequency Dielectric Spectroscopy (FDS) method. The sensitivity of the proposed sensor has been tested on samples with a moisture content within 1 to 5% demonstrating a good sensitivity and repeatability of the measurements. Keywords – Dielectric response, Power transformer; Mositure; Solid insulation; Moisture sensor; FDS; Moisture monitoring. J.A. Ardila-Rey, M.V. Rojas-Moreno, J.M. 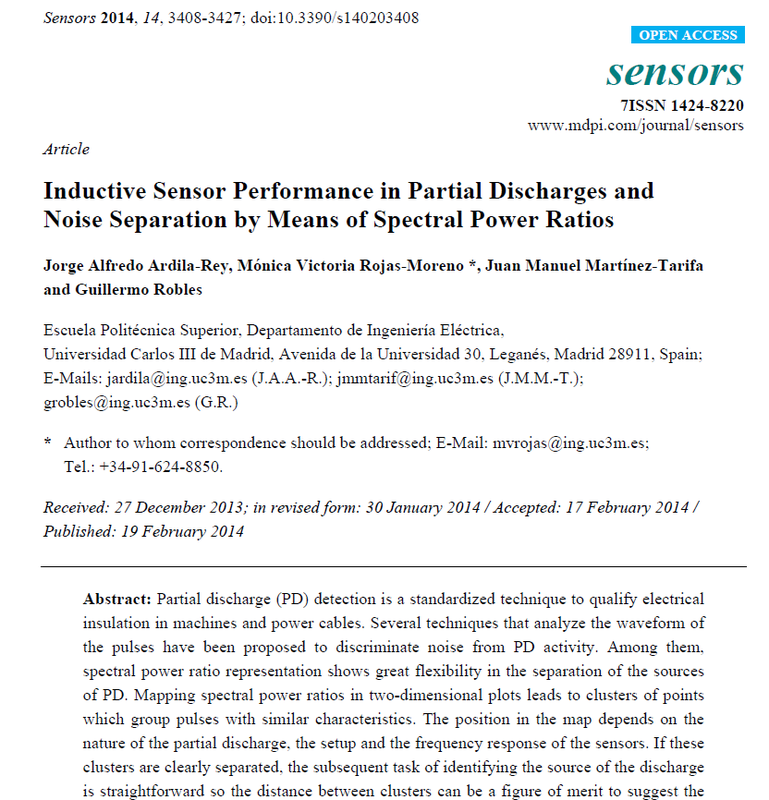 Martínez-Tarifa, G. Robles Inductive sensor performance in partial discharges and noise separation by means of spectral power ratios. Sensors 2014, 14(2), 3408-3427 (ISSN 1424-8220). Abstract – Partial discharge (PD) detection is a standardized technique to qualify electrical insulation in machines and power cables. Several techniques that analyze the waveform of the pulses have been proposed to discriminate noise from PD activity. Among them, spectral power ratio representation shows great flexibility in the separation of the sources of PD. Mapping spectral power ratios in two-dimensional plots leads to clusters of points which group pulses with similar characteristics. The position in the map depends on the nature of the partial discharge, the setup and the frequency response of the sensors. If these clusters are clearly separated, the subsequent task of identifying the source of the discharge is straightforward so the distance between clusters can be a figure of merit to suggest the best option for PD recognition. In this paper, two inductive sensors with different frequency responses to pulsed signals, a high frequency current transformer and an inductive loop sensor, are analyzed to test their performance in detecting and separating the sources of partial discharges. Keywords – partial discharges; noise separation; spectral power ratios; high frequency current transformers; inductive sensors.